Here we present the parameters to be determined in order to carry out the calibration. 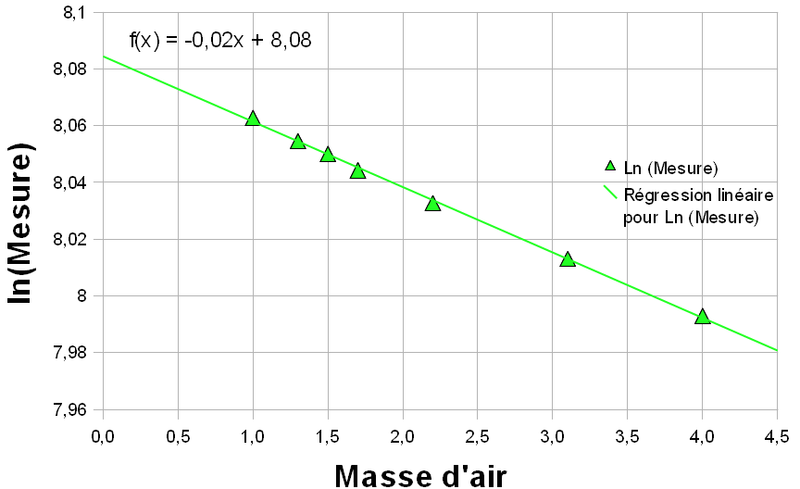 If a solar photometer sees the Sun through the different values of the relative mass of the air and the total atmospheric optical thickness does not change then the logarithm of the measurement is proportional to the relative mass of the air. By fitting a line through the data (a linear regression), the intersection of this line with the y-axis, where m = 0 is the logarithm of the measure that the instrument would produce if there were no atmosphere. This is called a "Langley" graphic calibration, named after Samuel P. Langley, the scientist who developed this technique in the early 20th century. (This work is described by Abbott and Fowle , as part of early efforts in the early 20th century to determine "the solar constant of radiation."). If the instrument was at 1 AU of the Sun, the measure would be more important than it was on 21 June. The solar photometers used in this frame can be calibrated by comparison in pairs, using a reference instrument for which a Langley graphic calibration was performed. This is called intercalibration.